Are you ready to be blown away? 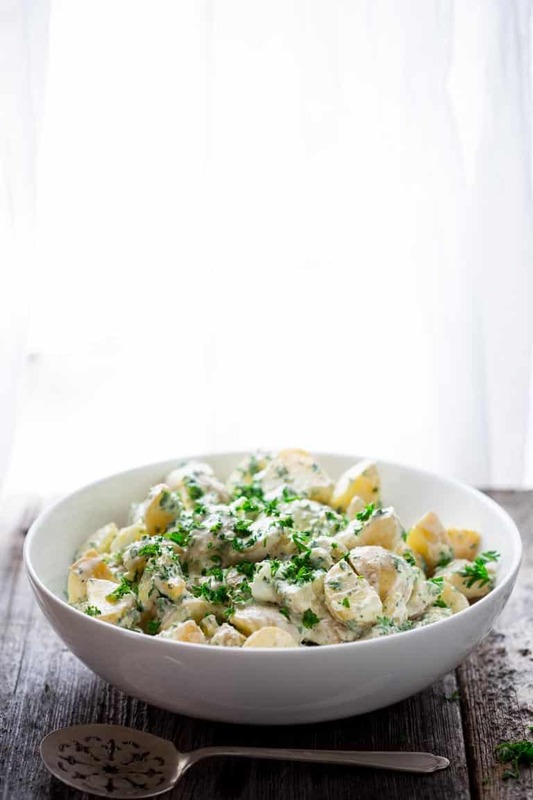 Well, this Creamy Horseradish Potato Salad is a healthier twist on the classic barbecue side dish and it is mind blowing. It is so creamy and full of flavor that everyone will line up to get a bite! Make it ahead for an easy vegetarian (gluten-free) side for all your easy breezy Summer cook-outs! I originally shared this recipe on April 17, 2011. I have updated the images and some of the text today. Grilling season is here and I know most of you have a family recipe for potato salad that you always make and it’s probably really good. 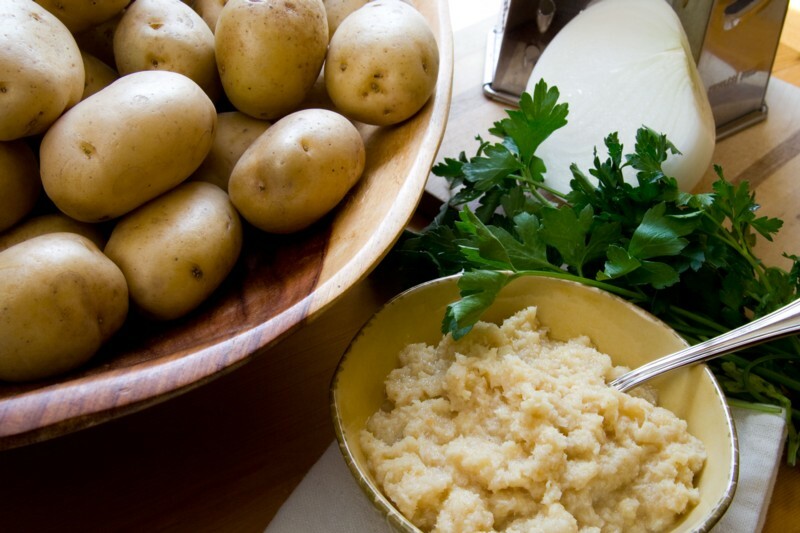 But believe me, you will want to try this healthier Creamy Horseradish Potato Salad. The horseradish really adds a surprising depth of flavor that will have everyone raving. And the uber-creamy (but lower in fat) dressing makes it taste soooo decadent. Speaking of that delectable dressing… I wanted it to be really creamy so I used thick and velvety non-fat Greek yogurt for the base of the dressing. To that I added only ¼ cup of full-fat mayonnaise, which gives it richness without too much added fat per serving. And the best part is this can be made the day before leaving you more time to just chill and grill! 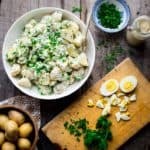 Have you ever added hard boiled eggs to your potato salad? It is so good! The bits of yolk mix with the dressing and potatoes to add even more creaminess and also nice bright color. And the chunks of the whites add a really nice and interesting texture. Then the fresh parsley gets folded in for a burst of color and texture that makes the whole dish extra special. 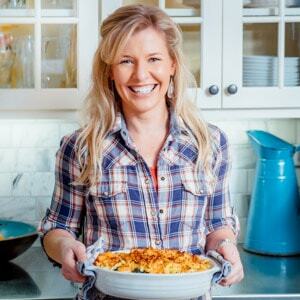 And just because there’s always room for more potato salad on your table this summer check out a few more awesome recipes from me and my blogging friends…. 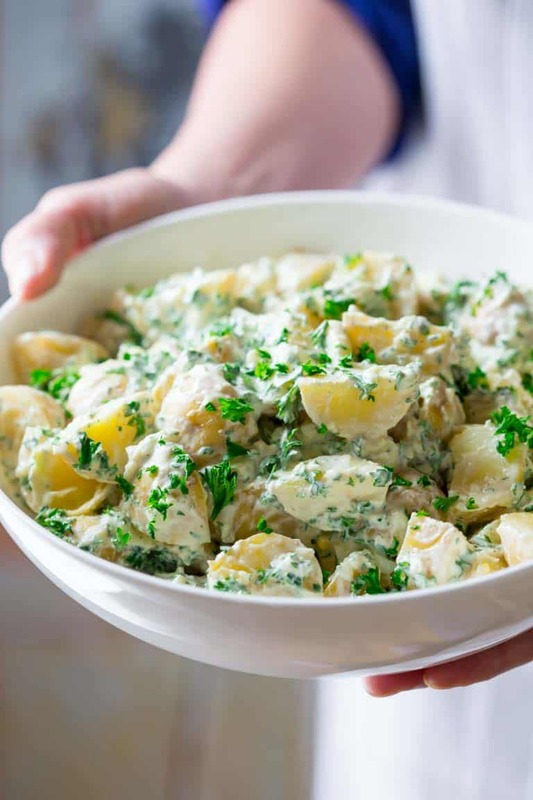 This Healthy Creamy Horseradish Potato Salad is a twist on the classic barbecue side. 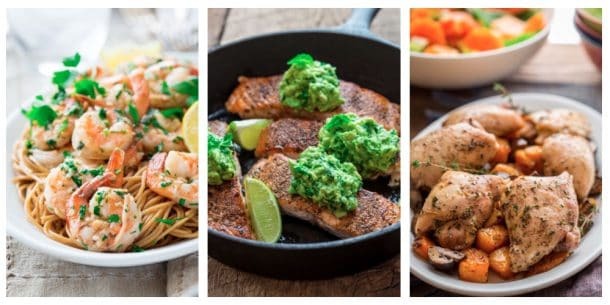 It is so creamy and full of flavor that everyone will line up to get a bite! Make it ahead for an easy vegetarian (gluten-free) side for all your easy breezy Summer cook-outs! Fit a large saucepan or pot with a steamer basket, and fill with water up to the bottom of the steamer.Bring to a boil, add potatoes and cook until just tender, about 15 minutes.Make sure that the water doesn’t boil away.Spread the potatoes out over a baking sheet to cool slightly. Meanwhile, stir together parsley, yogurt, mayonnaise, onion, horseradish, salt and pepper in a large bowl. Stir in the potatoes and eggs. Chill completely before serving, about 4 hours or overnight. To make ahead: Prepare up to 1 day in advance. tip* to hard boil eggs: Place eggs in the bottom of a small saucepan, cover with cold water by several inches. Bring to a gentle boil over high heat. Allow to boil for 1 full minute. Remove from heat and let stand 12 minutes in the hot water. Drain, run cool water over and cool. what a great idea! horse radish makes everything better! I love horseradish on just about anything. 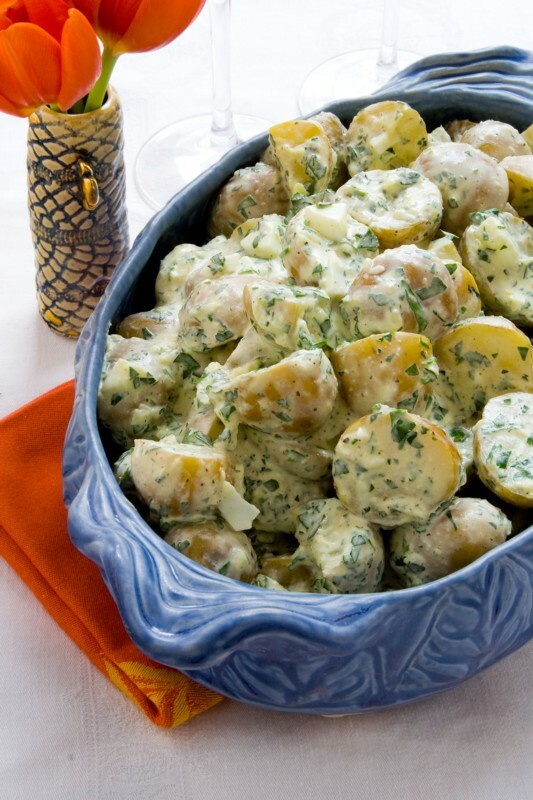 Can just imagine how heavenly it would be in a creamy potato salad. Made this today and it was a big hit with the hubs. Thanks for sharing! 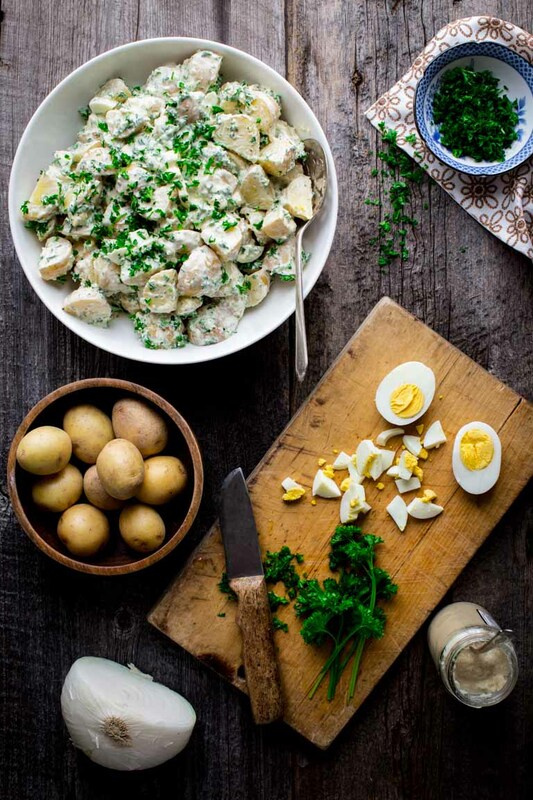 There’s nothing better than a chunky, ‘eggy’ potato salad ~ yum! Thank you Sue! So glad you dropped by. Have a great week. My hubby LOVES horseradish salad and potato salad! He would die and go to heaven if I made this for him! Well in that case, looks like you better! Ha ha. Thank you so much Kelli! Have a great day. I love to eat vegetable salad, but never thought that potatoes can be used for salad recipe. It is a good idea. I have made horseradish potato salad several times. To bump up the flavor, I finely dice a bit of jalapeno pepper to mix with some diced celery; I use cilantro instead of parsley and add 1 packet of Truvia to the dressing (the artificial sweetener blends instantly). The combination of the spicy horseradish, the tart yogurt, and the sweet Truvia is outstanding.